Well today we put up the old Christmas Tree here at The Nasty homestead. Did it along with the new Helix album "A Heavy Metal Christmas". Gotta say I love the new cd. 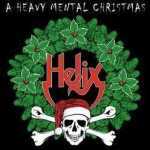 I'm a big fan of rock Christmas albums and the band Helix, so this is a real treat for me. My favorite song on the new cd is "Christmas Time Is Here Again!". Oh yea, we were rocking around that big old tree with that song. It sounds the most like classic Helix. The traditional stuff is great too, but that one really rocks. (All U.S Radio stations and online music sites should play this track.) I really liked the James Brown cover too, very nice choice. Out of all the Christmas Rock cds out there, The Helix boys are the only ones I know of to cover that song. Oh yeah, Santa got a brand new bag! Wanna say thanks to Brain and the band for the holiday cheer, since I got the new Helix album I'm simply having a wonderful Christmas time. Oh, and I got singer Brian Vollmer a big R for Christmas! I wonder how much that will cost to mail it to Canada?